Love that the comforter is reversible. Used the white side and purchased blue curtains to match the set. Great material. The Madison Park Essentials Cole Reversible Complete Comforter and Cotton Sheet Set creates a simple yet chic look in your space. The fretwork design creates a modern look with its white design on a soft grey base. This set is completely reversible to a white base with grey design allowing you to change the feel of your room instantly. A 180 thread count printed sheet set also features a smaller scale fretwork pattern for a finished look. The thread count is not disclosed in the ad. I was hoping for better quality. Looks great, but not comfortable . 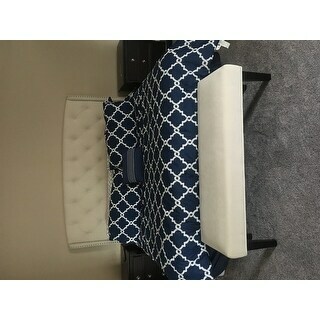 I was so excited about this comforter set, but I followed the washing instructions and can't even use the white side because it has blue stained all over it and the blue side and blue all over the white pattern. VERY disappointed. The spread is SHORT on the sides. Needs to be about 6 inches longer. Love this comforter set! I love the fact that it is reversible. The bedding is comfortable. Although instead of a bed skirt I wish it came with more accent pillows. It looks just like the picture. I was reluctant to buy these because some reviewers said they didn't wash well. But ours washed beautifully. For comforters they are the right thickness--not too thick and not too thin. Because of the sheets reviews, I decided to purchase a different pair of navy sheets but the ones that came in the package don't seem terrible. All in all an excellent value for the money! Beautiful comforter set. I am very pleased. I really love this comforter set. The quality is amazing for the price, and it helps that it came with all the accompanying cases, sheets and skirt. As always, I got the item very soon after placing my order. The delivery speed is one of the nicest features about shopping on Overstock.com. Colors are exactly what the photo shows. Warm, fits my king bed, comes with comfortable cotton sheets. Comforter is a good quality polyester material. Highly recommend it. I was hesitant to order the navy comforter set sight unseen. navy can be such a tricky color. know this color is a true navy... not bright blue nor purple tones at all. The comforter itself is a generous size &amp; it is so very soft &amp; pliable. the kind you want to snuggle down under not just looks pretty. if i had more bedrooms to decorate, i would order again. i can’t attest to the quality of the sheets as my son &amp; his wife took them for their bed. haven’t heard any complaints so i’m assuming they are fine. This bed n a bag was bought as a gift. It's very pretty and the reversible comforter is also nice. The sheets however leave something to be desired. They're rough but match comforter and pillows that came with it. If you're giving this to a child or teenager sheets are ok. I ended up having to purchase additional sheets to accommodate my guests in the guest room. I was told that they were pretty but sheets are itchy. So I found some really soft microfiber sheets to match and now all are happy. This bold-colored bedspread makes my daughters dorm room look better than the average dorm room. It has held up well for three years now and should make it graduation. A very good value. Have used it for almost 2 years with frequent cleanings and washings. No fading. wear and tear, etc. A bit too warm for summer use, but perfect 9 months out of the year. It’s perfect except for the fact that it’s not long enough for true Cal/King. white side of comforter has blue all over it, blue side has color faded out in areas...directions followed to the letter on wash. I love this comforter set. It did not fade when I washed it. Very beautiful blue color. Both the quality and design of this comforter set are beautiful! I love it!! Looks great. 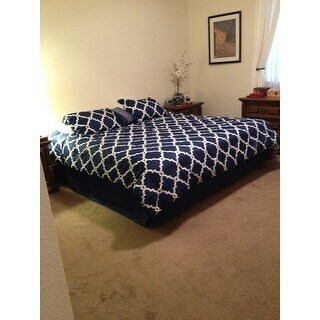 We have been looking for a nice comforter set and this one looks really nice on our California king size bed. Super soft. Would buy again. "Is this a actully comforter or duvet cover?" "i'm confused about color, in description it mentions light gray but pictures are all blue and white." This set is offered elsewhere in gray and white but not on this site. In the options, you'll see the navy and white and the other options. More than likely, the navy and white is automatic selected. This set is definitely blue and white. I've also washed the sheets several times since purchasing, I've used them about 2 months, and I have NOT noticed any color bleed or fade. So far. "Can I purchase the sheets only? Sue"
"Can you buy this without the sheets? Thread count is not very high. " I would not buy this set. I purchased it and the comforter is way to small!! As far as the sheets, my husband hates them. He said feels like sand paper. "What is the drop on the king bedskirt? Inches maytress to floor. Thanks "
the bedskirt hits the floor perfectly. 14" (fourteen inches) from the seam at the edge of the box spring to the floor. "Rhgptown.....what gives with so many people having a fading or color running when washing this set? I want to order a set but am holding off until I get a positive answer regarding washing product! Can you help me?" I have washed the sheets multiple times and they haven't run. "Is the comforter sewn on the pattern so that when you wash it the filling inside won't move/shift after?" Hello difonzorose, this comforter features 2 inch bar tracks sewn throughout the comforter so that the filling will stay in place. Thank you for shopping with us.